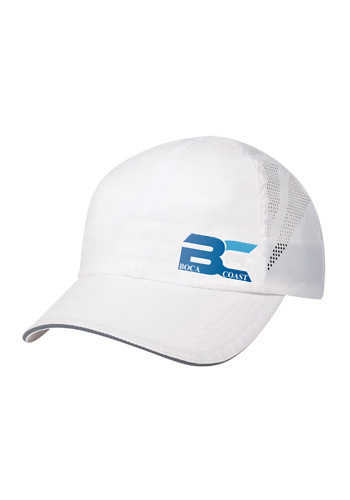 The Boca Coast Vented Ultralight Series Fishing Hat will keep your head cool, protected from UV rays and reduce the glare on the water! Made of durable yet soft ultra-light moisture-wicking material that pulls sweat from your body to the surface to quickly evaporate. This six-panel cap has a low profile, an unstructured crown and pre-curved reflection tip visor. There's no top button (those get Hot), it features mesh vents for breathability, a water-repellent sweatband, a reflective tipped visor and an adjustable self-material strap with Velcro (R) closure for a custom fit. In addition to all the features this great hat offers, the reflective visor is what really makes it special. We're avid anglers here at BC and anything that can give us an advantage out on the water is something we all want to have. This is the inshore fishing capital of the world, so we spend a lot time chasing fish across the flats. Sight fishing is part of everyday life here and being able to see through the glare into the water is vital. Much like polarized sunglasses reduce the glare and enable you to see down into the water better, this hat increases that ability and the performance of your polarized sunglasses by further reducing the glare coming off the water. Being able to clearly see the fish before they see you means catching more fish with less strain on your eyes! FREE Shipping!